Try to imagine having motivating music for your whole run and exercise routine! If Rhythm Runner does not recognise most of your music then follow the instructions for MixMeister set up! Tested on Google Nexus One, HTC Desire, Motorola Milestone, HTC Dream, T-Mobile G1. Full version add support for workout programs such as interval training and power walking. If you can verify other phones then please email us, if phones produce bugs, let us know when and where it happened and we will work on a fix. 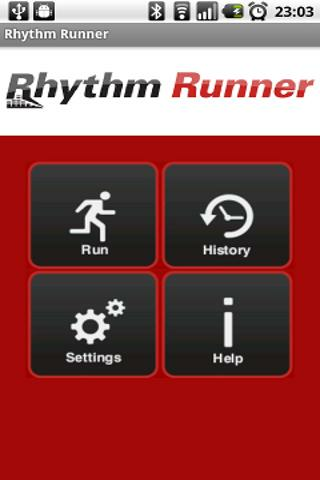 Contact info@rhythmrunner.net for any queries or bugs. The Rhythm Runner app is a supremely clever next-generation app that matches your music to your running pace. By using any smartphone’s accelerometer, it can measure your pace and automatically match music to the beats per minute of the music stored on your phone. For those keen runners out there, you know how annoying it is to have to keep stopping and madly pressing buttons to change a track. The Rhythm Runner app eradicates this problem. Featuring google map intergration, calorie counting, and speed trackers, this genius gadget is a holistic fitness feature. v1.4 More fixes to make the app better. v1.3 fixed a couple of bugs. Default ADW theme with colors inverted. Inverted icons require ADW Launcher 1.1.0+.